033, originally uploaded by Venus In Furs. Granie's 70th birthday surprise went off without a hitch. Thanks to Pops for organizing it and making it happen. We've all got some amazing memories that will last us a lifetime. Gibson referred to the Mohonk Mountain House as 'my new house'- and had a ball walking in the woods, exploring trails, swimming in the lake, digging in the sand, and swimming in the pool. He loved playing with his cousins and aunt and uncle and getting snuggles and tickles from Granie and Pop. 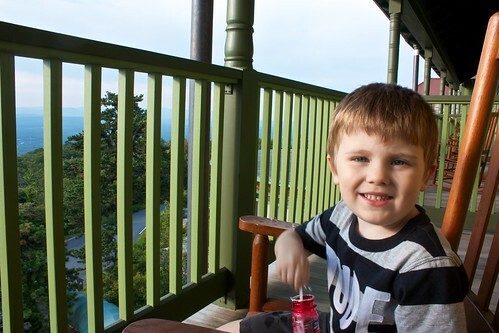 And I think he loooooooved having a porch just outside our room.... having easy access to 'outside' is something apartment dwellers miss out on.